You may still be able to book by calling the hotel at 512-863-5572. Sometimes all the weary traveler wants is to reach back to a simpler time and find a friendly mom-and-pop joint, with clean, comfortable rooms, a refreshing pool, and a reasonable price tag. Travelers to lovely Georgetown, Texas, need look no further than the Georgetown Inn -- a sunny little hotel with freshly painted rooms, free continental breakfast, outdoor pool and free wireless Internet access. Cheerful lavender and blue floral prints lend a bright, garden-like atmosphere to the spacious guest rooms. Located on the outskirts of the Hill Country, the inn is close to several interesting local attractions: the incredibly preserved Inner Space Caverns, where remains of prehistoric animals have been unearthed; the gorgeous lagoon and limestone bluffs at Blue Hole Park; and lovely Lake Georgetown itself. What's more, the hotel is within walking distance of several fine family restaurants and of the charming town square, which features some of the finest Victorian commercial architecture in Texas. 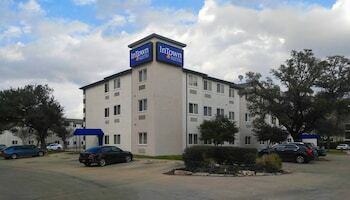 Georgetown Inn, Austin North - Georgetown is a 2-star hotel located at 209 N I 35, Georgetown, TX 78628, US . Its nightly price usually falls between $48.51 per night and $124 per night, excluding tax, depending on room category. $49 per night found for a Queen Room - Smoking - Non-refundable room type. Georgetown Inn, Austin North - Georgetown sells rooms through sites like Room 77, Expedia, Hotels.com, GetARoom, and many others. Room 77 searches across dozens of different sites to find the lowest discount rates available. The lowest rate we've seen over the last few weeks was found on Room 77. In 1% of the cases we surveyed, all sites offered the same rate. You can compare real-time rates from all of these sites on Room 77. Room 77 is the only hotel shopping site that includes special discounts like AAA, senior, government, military, and corporate rates.